"The first market, Cai Rang, we came across was full of large boats with their hulls literally bursting with produce. Some boats were so weighed down by the amount onboard they looked like they were about to sink. Smaller convenience store boats passed by offering coffee, tea, sodas, pho and other such goods. People travel up and down stream to this spot, anchor their boats and spend upwards of two weeks there until they've sold everything. We travelled upstream to reach our second market, Phong Dien, which was full of semi controlled chaos. Smaller boats filled with produce or household goods (detergent, incense, oil, aluminium foil, etc) nestled themselves into a little eddy of the river. To reach a particular boat you played bumper boats with each other and floated, pushed, bumped and banged your way through the crowd until you reached your desired boat. Our lady driver bought a pineapple and sliced it up for us which was a lovely treat"! 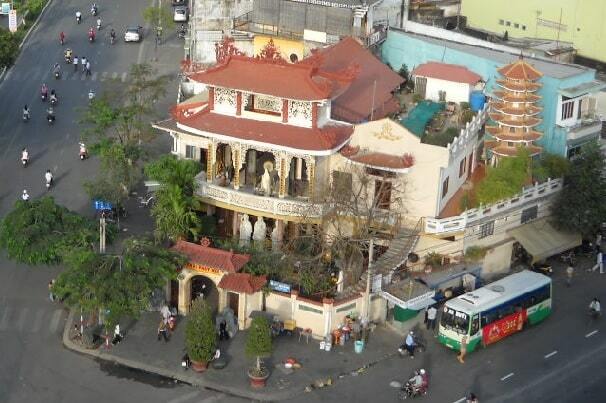 Can Tho - is the fifth largest city in Vietnam. It has 1.3 million inhabitants and is located in the southwest of the country at 160 kilometers from Ho Chi Minh City. The region of Can Tho is regarded as the storehouse of rice for the country. The economy of the country thus revolves around agriculture; rice in particular. The city is situated on the banks of the Hau River, most of which is on the southern side. It was formerly known as Can Tho, the capital of the west, but today it is known for its rice production. The city is definitely worth a visit, not just only for its two large floating markets, where they trades of kinds of everything. 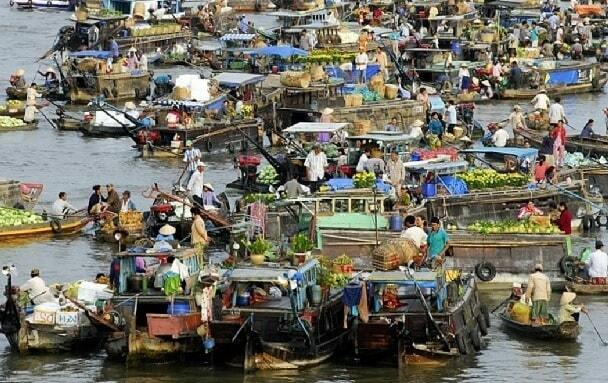 These markets are: the Cai Rang and Phong Dien, the first of which is the largest floating market. But there is more to see: the Cathedral of Can Tho, Buddhist pagodas, the Binh Thuy Ancient House, museums and parks. Can Tho is a place to experience the local life in a relaxed way. There are too many things to do. Although there are a few museums, they are usually open on special days. Even expats who live in the city, never even have heard of or visited. If you have cycled or you have made a cruise made in the Mekong Delta, you will experience in Can Tho again that Asia is changing at a rapid pace. The most famous activity in Can Tho to visit the floating market in the morning. Hai Ba Trung street is one of the most important areas of Can Tho. It lies directly on the River Hau. 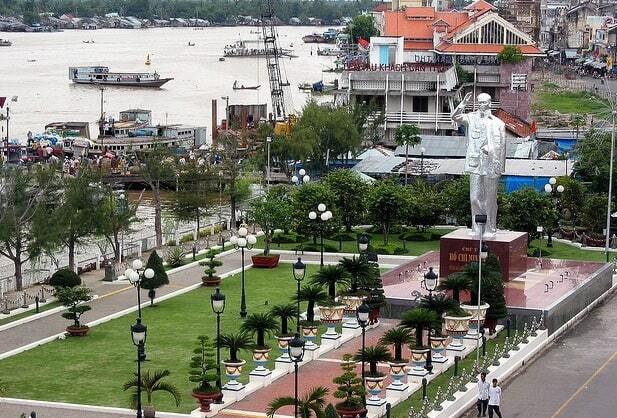 There is a park on the river with a statue of Ho Chi Minh. Can tho was the last city, which was captured by the Vietcong, one day after the fall of Saigon. There are near numerous hotels and restaurants and from here you can book boat trips, for example to the floating markets of the Mekong. 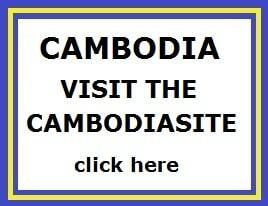 Just go in search of a friendly guide who speaks English quite well. He will also help you with your desired private trip. Cai Khe Market is a big market in Tran Van Kheo street. This procurement is done for businesses, including restaurants and hotels, but the locals come here too. The market extends on both sides of the street. You'll find this market everyday products, such as fish and other fresh foods. At the other end of the market are some wholesalers for textiles or other household articles. The Xuan Khanh Market is primarily a market for fresh food, fish, vegetables and fruit. Other products are sold on the upper levels for daily needs. The market is in the Mau Than Street. Many locals still use the name Tham Tuong Market, but officially it's called the market Xuan Khanh. If there is any confusion to find the market, Iris Hotel is a good landmark. This is across the street. The main market of Can Tho was an open market on the Ninh Kieu pier. Now you can still see the original, beautiful old market hall (left), surrounded by a garden along the river. Today, the market C�i Khe and Xuan Khanh Market has more visitors. The locals like to spend the evening by around the Nguyen Trai bridge. At the river one looks cool and it often blows a cool breeze. Another beautiful place with scenic Ho Xang Thoi is a small pond, surrounded by the typical Vietnamese apartments, as you often see. Have a nice picture during sunset! Can Tho has an airport, but is easier to reach by road. It takes about four hours to reach Can Tho from Ho Chi Minh City and about three hours from Chau Doc. Buses to Can Tho usually cost between � 3 and � 6. 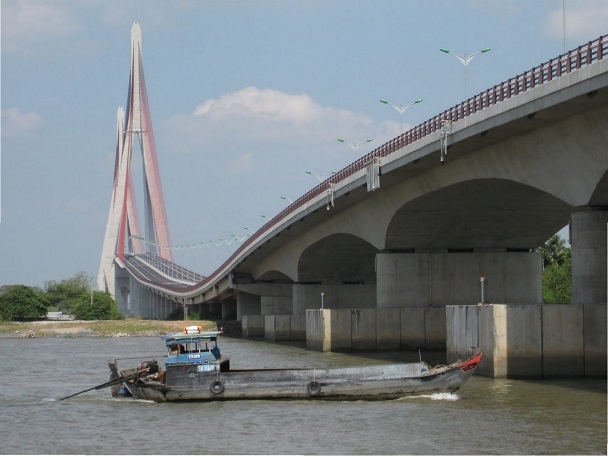 If you travel by bus from Ho Chi Minh City is, you come across the Tho Bridge in the city.